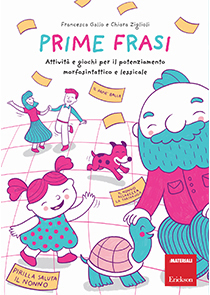 Pages: 276 + racconto "La giornata di Pirilla" + Tabellone "Il gioco dell'oca"
A key stage in the linguistic development of a child is the reaching of good competences on a morphosyntactic level. In fact, the ability to coordinate syntagms in order to build phrases in an orderly and effective way results in richer, more satisfying communication. Through the adventures of the Piripilli family, this book contains worksheets of increasing difficulty aimed at elaborating phrases of the subject+verb and subject+verb+object kind. Plenty of fun activities for individuals or small groups allow children to internalise and generalise the competences practised. The book comes with two attachments which integrate and enhance the workbook: the colour story of a day in the life of Pirilla and a fun game poster. First phrases targets therapists, teachers and parents who need simple and effective tools both for rehabilitation and for stimulating and developing morphosyntactic expression in children aged from 2 and a half years upwards.